Voters will decide on Tuesday whether to re-elect 53 incumbent legislators or choose many new faces to be part of the 56th Legislature. With the benefits of name recognition and typically a fundraising edge, the majority of these incumbents are expected to win. 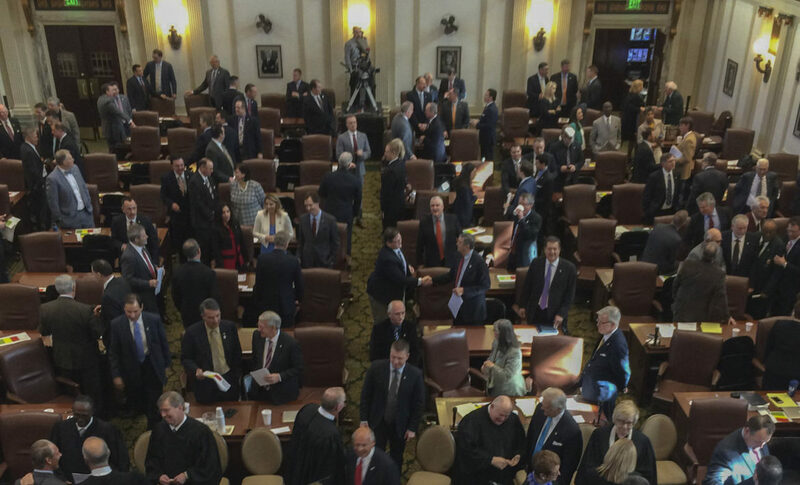 But a SoonerPoll survey taken this summer found only 34 percent of likely voters held a favorable view of the Legislature. That is two percentage points lower than President Barack Obama’s favorable rating in Oklahoma. The unpopularity of the Legislature was also reflected by the record number of candidates who filed for office in April. Many openly criticized lawmakers’ handling of the state budget crisis and the lack of funding for public schools. Three incumbents – Rep. Dennis Johnson, R-Duncan; Rep. Ken Walker, R-Tulsa, and Sen. Corey Brooks – were defeated in the primary. Recently released state voter registration numbers show many incumbents could be in danger of joining that list. In addition to races to watch based on campaign fundraising, here are some more contests keep eye on. Sen. Joseph Silk, R-Broken Bow, is looking to his secure his second term representing Senate District 5 in southeastern Oklahoma. But to do so, he needs to convince many independents and Democrats to vote for him. That’s because the final voter registration numbers show Democrats make up 66 percent of the voters, while Republicans account for just 23 percent. Among Senate districts, District 5 has one of the lowest percentage of Republicans in the state. Silk is facing Battiest Public School Superintendent Stacey Allen Ebert, a Democrat who was endorsed by Oklahoma Parents and Educators for Public Education, a group backing backing educators or supporters of public education. Sen. Larry Boggs, R-Red Oak, also looks to face a tough contest in his re-election bid for Senate District 7, which includes McAlester and rural areas just north of Silk’s Senate District 5. His Democratic challenger is Pittsburg County Sheriff Joel Kerns, who is running in a district where Democrats outnumber Republicans by a more than two to one. The registration tallies show Democrats make up 62 percent of voters compared with 26 percent for Republicans and 12 percent for independents. Rep. George Faught, R-Muskogee, will also need strong cross-party voting or a large Republican turnout in his quest for a fourth term in House District 14. Republicans comprise 33 percent of the district’s 20,973 registered voters; Democrats have 53 percent and independents 14 percent. Faught is facing Democrat Lee Ann Langston, executive director of Downtown Muskogee Inc. Neither candidate had a primary challenger. Some Democrats also must strive to keep their current seats. Rep. Cyndi Munson, D-Oklahoma City, won in a special election in House District 85 last year with just 53 percent of the vote, replacing Republican Rep. David Dank, who died in office. She may be in for another tight race. Democrats make up 37 percent of registered voters in the district in northwest Oklahoma City. Republicans have 49 percent and independents 14 percent. The district traditionally has gone to Republican candidates, including Gov. Mary Fallin, who held the seat from 1990 to 1995. Munson faces Matthew Jackson, who defeated four opponents in the GOP primary. Jackson, former chairman of the state Republican Party, also ran unsuccessfully ran for the seat in 2015. Campaign finance filings through Oct. 24 show Munson has about $203,200 this year compared with Jackson’s $63,780. Because of term limits, Sen. Susan Paddack, D-Ada, is unable to run again in south central Oklahoma’s Senate District 13. The seat has traditionally gone to Democrats, but could swing back to Republicans for the first time in decades. That’s because Republicans make up just over 50 percent of its registered voters. Democrats account for 37 percent and independents 13 percent. Greg McCortney, a city council member and former mayor of Ada, is the Republican candidate. Eric Hall, band director at Ada High School, is the Democrat. An unusual aspect of the race is that it is one of the few where Oklahoma Parents and Educators for Public Education has endorsed both candidates. McCortney, however, holds a sizable fundraising lead, with $166,861, including a $45,000 loan, raised this election cycle. Hall has raised only $38,630.